Home › Books / Media › “While The Bombs Fell” – Wednesday’s Bookmobile Experiences “Life In Wartime”! Bravo Robbie Cheadle and Elsie Hancy Eaton! This Wednesday’s Bookmobile is going back to a time and place when children would routinely have to seek shelter in the London Underground because of bombing over the city! Imagine living during wartime, in this case World War II in a town outside London – an experience that has been vividly brought to life by a terrific Blogger, Robbie Cheadle and her Mother, Elsie Hancy Eaton – who lived through it! “She felt relieved that she didn’t have to worry about her gas mask anymore. The family’s gas masks lay forgotten in their boxes. The British Government’s anxieties about chemical warfare had not materialized. I think as a culture we have forgotten just how horrible the impact of war is: they currently happen too far away from us, especially here in the US, and the human toll is forgotten…that’s why I loved this book because it matter-of-factly tells the story of life in wartime. I think one of the most powerful aspects of this book is that, while worried about German bombers overhead, life also went on with a goal of “normalcy” amid the madness. “Despite the war raging across the English channel, daily life continues with its highlights, such as Christmas and the traditional Boxing Day fox hunt, and its wary moments when Elsie learns the stories of Jack Frost and the ghostly and terrifying Black Shuck that haunts the coastline and countryside of East Anglia. Yes, you read right: some World War II recipes like this one, for Lord Woolton pie, which is a pastry dish of vegetables, widely served in Britain in the Second World War when rationing and shortages made other dishes hard to prepare. Robbie is also the Author of six children’s picture books in the Sir Chocolate books series for children aged 2 to 9 years old co-authored with her son, Michael Cheadle. These are great books that inspire children to create, and I love them as well. As for “While The Bombs Fell”, I bought mine from Amazon Kindle, and it’s only $1.99 – so click this link and buy this terrific memoir! Hope you enjoyed this Wednesday Bookmobile – you can click on my website to see more of them! ‹ The Dark Side Of Fame! Three “True Tragic Tales” Of Hollywood! Thank you, Debby. John is incredibly artistic and I thought his presentation and layout was lovely. I am going to try and replicate it for some of my reviews. I’m trying to highlight all of the great work being done by the terrific Bloggers I follow! Thank you so much, Bette. You are very kind to share. What a great review of Robbie’s book, John. I could feel the breathing through the gas mask. My parents escaped to China when Japan took over Hong Kong, so they didn’t have first hand threatening to tell. Thanks for the comment, I’m always eager to share stories from fellow Bloggers! Thar’s great, John. We all need each other’s support and cheering!! Thank you, Miriam. I hope you enjoy it when you get to it. That must have been a frightening time for your parents, Miriam. Did they go back to Hong Kong after the war then? Yes, my parents, my older sister and one grandma did. The transportation was not running right after the war. They went on foot following the railroad track for 50 miles to go back to Hong Kong. Wow, these pictures really brought home to me the fear that must have prevailed during that time. We, humans, are a cruel bunch. I have Robbie and her mom’s book on my TBR and look forward to the read. It is largely due to greed and selfishness in my opinion, John. Thank you, Jacqui. It is hard to imagine growing up during a time of such uncertainty. My mom was relatively lucky as her father was a farmer so he didn’t have to go to war. He stayed on the farm and helped feed the nation. Despite my mom’s family having a farm, the children were frequently hungry. Thank you for featuring Robbie today, John. She is a treasure. John Rieber show cases Robbie Cheadle and her mother Elsie Hanley Eaton and their book While the Bombs Fell based on the memories of Elsie in World War Two… a terrific post. Thank you, Sally. I appreciate your sharing. Such an amazing story–one that shouldn’t be forgotten. Thanks for featuring this, John. Thank you, Jacqui. We must remember the horror of war and try and prevent a occurrence especially now when the world is so uncertain. I enjoyed reading this book. My parents also lived through the war, and had similar stories to tell. I am sure they are very interesting stories, Stevie. Mum said she was sitting in her front room aged about 20 when all the windows smashed and she was covered in glass. When she looked out into the street, several of the houses were no longer there. A great post on Robbie’s wonderful book. I enjoyed it as well. LIke you say, those of us raised in North America have no idea about how war affects people, especially children. The pictures you have included are perfect!! Darlene, thanks so much for the comment – and I agree with you! America has experienced some terrible wars but I suppose they haven’t been on your home front so you don’t get to experience the deprivation and shortages as they did in Europe. Thank you, John Rieber, for the amazing article about While the Bombs Fell. John has included some lovely photographs in this post and made it very visual and interesting. If you haven’t visited John’s blog before it is a most interesting and unique mix of food, books and movies and well worth a visit. 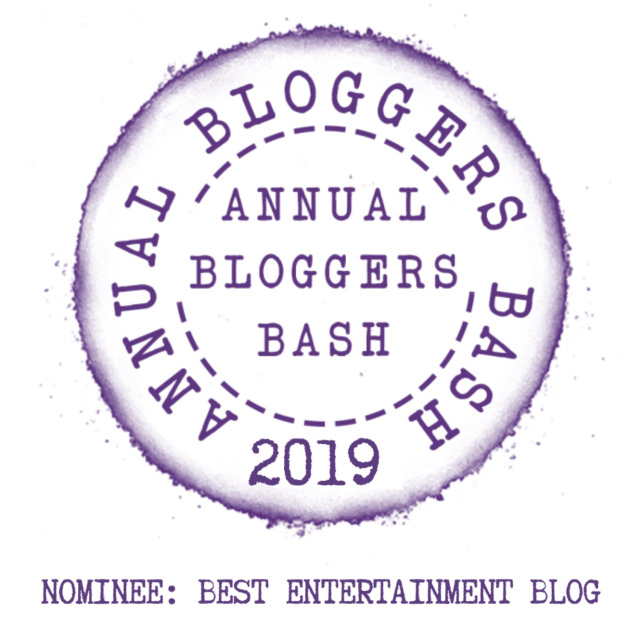 John’s blog has been nominated for an award at the 2019 Annual Bloggers Bash in the category of Best Entertainment Blog. Lovely to see Robbie here. I have this on my kindle and hope to get to it soon. Mary, I have it on mine as well, and my wife is going to read it next – well, after she finishes the “Furious Love” memoir about Richard Burton and Elizabeth Taylor! Let us know what she thinks of Furious Love when she’s finished it. I loved his voice – wonder if Elizabeth did. Thank you, Mary. I know all about the towering TBR. I hope to have a few days in May in whcih I can read more than I am at the moment! Thank you, John, for featuring our book here. We are delighted. I will share it on my blog tomorrow. Robbie, I focus on stuff I love on my Wednesday Bookmobile, and I loved this memoir…so many people have NO history of a world at war, and the danger and sacrifice that is an everyday fact of life…and it’s beautifully written! Thank you, John. I am so pleased you enjoyed it and understood its meaning and style. I did write this book because I think it is very important for the younger generations to remember so that they avoid making the same mistakes. Yes, here in the US I don’t see nearly as much awareness of the suffering around the world – and for me, the fear is we are ill-prepared to handle any situation like this…or just assume it could never happen – wouldn’t it be nice if this type of world conflict never happened again? Thank you so much, Pete. It is appreciated. I have done my voting too. Pete, that was so generous of you! I saw the list of nominees and thought: “wait, I’m up against OLLIE!?!?!? !” It’s a honor to be in the same category as you! Thank you Pete, high praise indeed from you! I have bought Robbie’s book, but have yet to read it. It reminds me of my Mum’s wartime experiences during the Blitz in London. She was 15 in 1939, and saw it all. Thank you, Pete. I appreciate your support. The American pilots also suffered during the war, John. There are some wonderful sites including their letters and memories of that time. I suppose the people at home felt it less as they didn’t have food shortages or get bombed. America has a most interesting history with lots of conflict. I just finished reading Charles F French’s book Maledicus which includes some detail on the war in Vietnam – too awful for words!